Huge gestural paintings of tractors fill the gallery walls with energy and passion in Karen Carson's latest show. The subjects, mundane machinery usually driven by men, are transformed into brilliant meditations on landscape and culture. Although Los Angeles based, Carson spends ample time in Montana and it is there where she not only takes in the vast landscape but also encounters tractors. To Carson's eye, a tractor is not merely a tractor. It's an imposing vehicle, an economic and cultural reality and something that must be looked up to, the more so when it is painted in basic primary colors. The surfaces of the machines shine and shimmer in the light. The vehicle's huge black tires are its support. Carson studied and observed the nuances of these over the top machines and in essence has created their portraits. 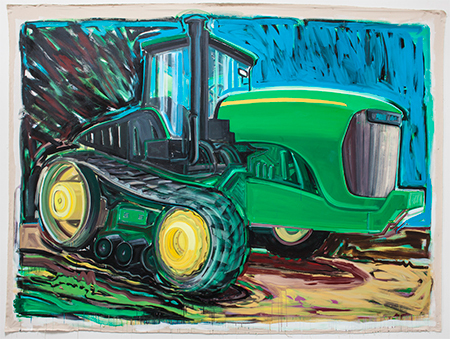 Each tractor has its own personality and raison d'etre and is painted to reflect Carson's metaphorical relationship to it. One is titled "Big Love," others "Big Friend" and "Big Guy." Carson's style of painting is to cover large areas with swooping brush strokes. Her more carefully rendered tractors are placed into this recognizable yet abstracted landscape. One could imagine the vehicles departing from their unstretched canvas frames and vanishing into the distance of a cartoon world.